Thanks to your feedback, Swimia has turn out to be in just many months one essentially the most significant websites of swimming pools. Here you've got all the info we know about Macquarie University Sports and Aquatic Centre, in Sydney. 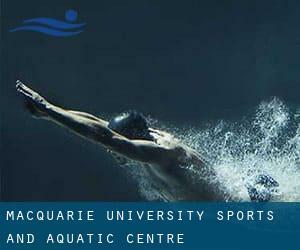 Don't forget you can also promote this pool so Macquarie University Sports and Aquatic Centre will appear the very first of Sydney, or even the first of one's country, make contact with us to know more. This great and large sports centre lets professional swimmers like you enjoy Olympic size x 20 meters, 8 lanes, 1.3 meters - 2 meters depth, 1.3 meters - 2 meters depth, Outdoors. Additionally, within these facilities you can try 25 meters x 12 meters, 6 lanes, 1 meters - 1.5 meters depth, 1 meters - 1.5 meters depth, Indoors. Phone number and e-mail address are number for this Swimming Pool. If you believe that any of the knowledge is incorrect, please contact us. Support us be better day-by-day. Updated on 2019 The Parkway , Bradbury , Sydney Metropolitan Area , NSW , AUSTRALIA (Postal Code: 2560). This sports centre offers 25 meters, 8 lanes, Indoors. For this Swimming Pool, only phone number is number here. Updated on 2019 Carwar Ave. , Blakehurst , Sydney Metropolitan Area , NSW , AUSTRALIA (Postal Code: 2221). Among all the activities offered by the centre, for anybody who is interested in swimming you can expect to appreciate Olympic size, 7 lanes, Outdoors. Just in case you wish to contact this Swimming Pool just before dropping by, we only know the phone number. Updated on 2019 Amour Park, Marco Ave. , Revesby , Sydney Metropolitan Area , NSW , AUSTRALIA (Postal Code: 2212). Swimmers like you have reported Olympic size, 7 lanes, Outdoors. Also, you will find 25 meters, 6 lanes, Indoors. Just in case you need to make contact with this Swimming Pool just before dropping by, we only know the phone number. Updated on 2019 Portland Street , Enfield , Sydney Metropolitan Area , NSW , AUSTRALIA (Postal Code: 2136). Swimmers like you reported 25 meters, 8 lanes, Indoors. Phone number and e-mail address are number for this Pool. Updated on 2019 Merrylands Park , 17 Burnett Street , Merrylands , Sydney Metropolitan Area , NSW , AUSTRALIA (Postal Code: 2160). This sports centre provides Olympic size, 8 lanes, Outdoors. For this Swimming Pool, only phone number is number here. Updated on 2019 89-113 Kent Street , The Rocks , Sydney Metropolitan Area , NSW , AUSTRALIA (Postal Code: 2000). Among all of the activities offered by the centre, in case you are keen on swimming you will take pleasure in 20 meters, Indoors. Just in case you need to contact this Swimming Pool before dropping by, we only know the phone number. Updated on 2019 Fields Road , Macquairie Fields , Sydney Metropolitan Area , NSW , AUSTRALIA (Postal Code: 2564). This sports centre gives 25 meters, 8 lanes, Indoors. For this Pool, only phone number is number here. Updated on 2019 Milson Road , Cremorne Point , Sydney Metropolitan Area , NSW , AUSTRALIA (Postal Code: 2060). This sports centre gives 22 meters+/-, 2 - 3 lanes, Outdoors. For this Swimming Pool, only phone number is number here. Updated on 2019 Corner of Emerald Drive and Feldspar Road , Eagle Vale , Sydney Metropolitan Area , NSW , AUSTRALIA (Postal Code: 2558). This sports centre offers 25 meters, Indoors. For this Swimming Pool, only phone number is number here. Updated on 2019 4 Alfred Street South , Milsons Point , Sydney Metropolitan Area , NSW , AUSTRALIA (Postal Code: 2061). Swimmers like you have reported Olympic size, 8 lanes, Salt Water, Outdoors. Also, you will find 25 meters, 6 lanes, Salt Water, Non-Chlorine Sanitized, Indoors. Just in case you want to make contact with this Pool before dropping by, we only know the phone number. Updated on 2019 Church Street , Lidcombe , Sydney Metropolitan Area , NSW , AUSTRALIA (Postal Code: 2141). Swimmers like you reported 25 meters, 6 lanes, Indoors. Unfortunately we do not have the e-mail address of this Swimming Pool, but we can give you the phone number. Updated on 2019 28 Albion Street , Surry Hills , Sydney Metropolitan Area , NSW , AUSTRALIA (Postal Code: 2010). Swimmers like you reported 20 meters, Indoors. Unfortunately we do not have the e-mail address of this Swimming Pool, but we can provide you with the phone number.